Fitzroy is an example about how bad and how good it can get with graffiti. There is tagging everywhere in Fitzroy and the names of some major street artists appear amongst them, like Happy and Phibs. Not that business is suffering due to the tags, there are plenty of customers on Brunswick St. and Smith St. and none of them seem disturbed by the graffiti. Indeed many business on these streets appear to try attract customers with the quality of street art decorations on their building. If Fitzroy is as bad as graffiti can get it can then it is actually less of a threat than noxious weeds. Along with the tagging there are some magnificent and beautiful works of street art that contribute to Fitzroy’s trendy, artistic and dynamic image. Not all of the street art in Fitzroy is aerosol art. Paste-ups are getting bigger and better; there are some good paste-ups near the corner of Gertrude and Victoria Parade, along with some aerosol work by A1one from Tehran. Further along Gertrude St. there is a tree with its truck and branches covered with croqueted dollies. The lace covering appears almost natural and very beautiful. It is obviously the work of the shop that it is in front of, Cottage Industry. In Fishers Lane there is a lot of great street art, it is mostly aerosol pieces but also some quality paste-ups and stencils. Without the color street art the car park in Fisher’s Lane would be a very ugly urban location. One of the best works in Fishers Lane is the “The Banality of Evil” is a great series of paste-ups. Prints of watercolor monotone paintings of a masked man doing the shopping, laundry, cooking and gardening. It is important to remember in these times that the most evil, cruel people in this world are living ordinary suburban lives. And it is important for this message to be on the street rather than preaching to the converted in art galleries. Another great little location is Little Smith St. is basically an alley but it is also a gallery of famous Melbourne stencils artists including Optic, Psalm and HaHa. 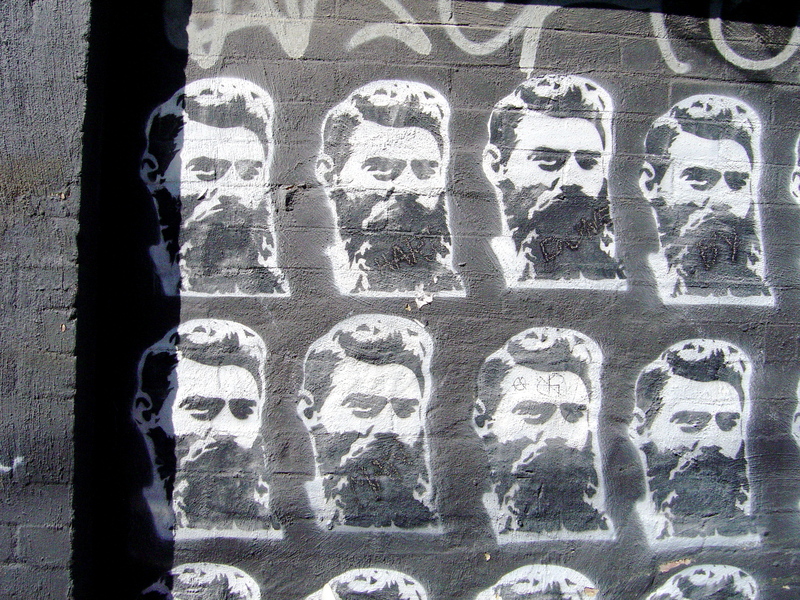 Little Smith features a very good version of HaHa’s Ned Kelly stencil in block of Warhol-like repetition. There are so many good locations in Fitzroy and so many quality work of street art along with all the tagging. This is just a sample. This entry was posted on Monday, September 15th, 2008 at 11:11 PM	and tagged with A1, croquete, Fitzroy, graffiti, HaHa, paste-ups, Phibs, stencil art, tags and posted in Street Art. You can follow any responses to this entry through the RSS 2.0 feed. Hi Mark, sadly some nob has started to spray over The Banality of Evil :-( I took photos while it was still fresh – see http://indolentdandy.net/fitzroyalty/2008/08/01/the-banality-of-evil/. You were right, I organised the doilering of the tree, it ‘belongs’ to Cottage Industry. It’s been fun sitting in the shop watching people photograph and exclaim over it. The funniest time was during the weekend of the art fair- I think we could have sold it for quite a bit! Hey I could not Agree more – love fitzroy Graf in all it’s splendor, good and bad. Paste Ups lately are out of this world!